More on the ProMounts Universal Articulating Multi-Angle Wall Mount for 10-24 inch Displays (Black) SA-PRO100 below. The SA-PRO100 is an extremely flexible, articulated, and retractable multi-angle wall mount for small flat panel screens from 10" to 24". 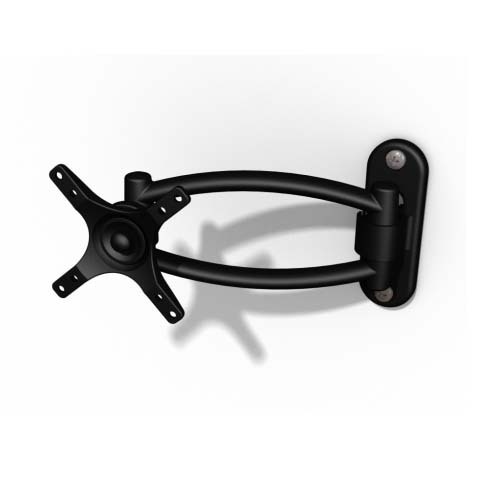 Single-arm designed for maximum extension, flush folding to the wall, flexible viewing from any room position or corner mounting for multiple room viewing. Attaches to a single stud and concrete or aggregate walls. Universal mounting pattern will fit virtually any flat screen TV from 10 to 24" and up to 40 lbs. Easy mounting on a single wood stud or concrete walls. 10-24" plasma, LCD and DLP flat screens up to 40 lbs. Vertical Hole-Spacing: 2.95 - 3.94"
Horizontal Hole-Spacing: 2.95 - 3.94"
Depth: 03.00 - 15.00 in.